Once upon a time there was a woman who started a website in her basement. It wasn’t a dank, dusty, musty basement like you might imagine. Her room in the basement was painted green. It had windows that let in some light but not too much light and the ceiling was very low and it’s dramatic to have started such a project in a basement. She started her website and people liked it and one day just over a year later she went to Ohio for a trade show to see if maybe she could make that website into a business. She flew on points and stayed at her friend’s house and felt lucky to be able to take such little financial risk. Before her trip, her kind book editor suggested she email another author who would be at the show, thus ensuring she’d know at least one other person. This book author was friendly and outgoing and showed the woman what a trade show is all about. Over the years she never did make a very good business out of her website, but she did enjoy the website a lot and she made great friends from all over the world because lovely people volunteered to work on it with her and she got lots of work doing other things and all that made up for her only sometimes barely breaking even on the website. And twice a year she would fly to that trade show except once she took the train, and she would do lots of business and see some of her great friends. After a few years, the woman got a wonderful job that made her too busy to work all the time on the website, and so she changed it so it wouldn’t take up so much of her time but also so that it would be better and would allow all the people who enjoyed it to participate with it lots more. Eventually, the time came for the woman to move on. There were other websites she wanted to play with and other topics she wanted to spend her time on. Someone else took over the wonderful job and a company took over the website, but the woman still went to the trade shows. She realized at her last one that she was mainly going just to see her great friends and to make new ones and she started wondering if that’s a good enough reason to attend a business event. She hasn’t figured out the answer yet. I don't know if it is, but I certainly hope so. You'd be sorely missed otherwise. Regardless, you'll be loved and supported in whatever comes next by a whole lot of people that are awfully glad that you did start that website in your lovely green basement. I couldn't agree more with Amy. Perhaps now you're an emissary for the more important side of the equation: human connection. I agree too. It wouldn't be the same without your energy and spirit. But no matter we will support and be excited for whatever is next in your book of life! You all sure know how to make a woman feel loved. I love you all, too. Once upon a time, almost 33 years ago, a very happy woman became a mother who is now so proud of this woman who always knows her own mind and is brave and confident enough to follow her intuition when it tells her to value current friends, make new ones, and embrace all the turns in the road of life! Love this. I realized long ago that I was going to Rhinebeck year after year for the people and not for the yarn. Ok, ok, the people AND the alpacas. Yes, she really, really does. You spin a very nice fairytale, Kim! I thoroughly enjoyed reading it. 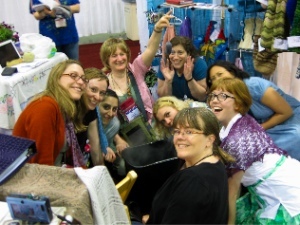 We spend so much time in our collective green basement, it's important to get out now and then :)I feel absolutely justified in going to TNNA for no “reason” at all and hope you will continue to too. To be surrounded by people who so clearly love to do what they do is inspiring and restorative regardless of where it takes you. Plus, you know, I'm still longing to just nip down to the lobby for an hour or two after dinner. important lesson learned: screw fashion, wear comfortable shoes!